Over the weekend, I had the great privilege of judging food submissions for the Atlanta Nosh. For those of you not familiar with it, it's like an underground food event. The lady who's organizing it also does the Atlanta Underground Market - a monthly members-only foodie gathering. If you enjoy food, it's a very cool idea. Anyway, I had a ball!!! I also ate waaaaaaay too much food. Shouts out to my new foodie friends - Nik, Lilly, Harvey, and Lyn. While there, I had the opportunity to try kale for the first time. In fact, I tried like 3 different kinds of kale. Honestly, it wasn't the greatest thing I've ever tasted. But, my foodie comrades above assured me that there was still some great kale out there to be had. So, I'm willing to try it again. Now, the interesting thing about this kale is that I'd just seen an interview in this month's Bon Appetit Magazine with our hometown Hip Hop hero (and Top 5 Dead or Alive) - OutKast's own Andre 3000. According to the article, he's now taken to eating kale over the every popular Southern comfort dish (and one of my favorite veggies) collard greens. This amazed me!!! First, it made me feel totally out of the loop as a budding foodie. Second, I really wanted to know what I was missing out on. I'm positive that this was why I was so eager to try the kale at the auditions. 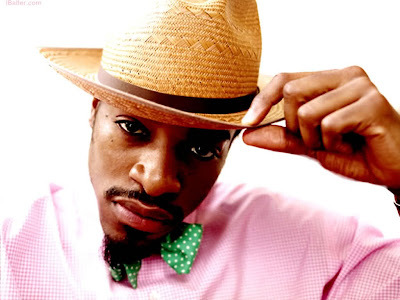 Click here to see what 3 Stacks had to say about the nutritious greenery and check out his recipe below. Also, if any of you are familiar with kale and can educate me a little bit more or put me on as to where to find the good stuff, leave a comment. Love it. I've put it in everything from my smoothies to lasagna to just plain sauteed with garlic and onions. All kinds can be found at Dekalb Farmer's Market and when the local food markets start up again around various neighborhoods. 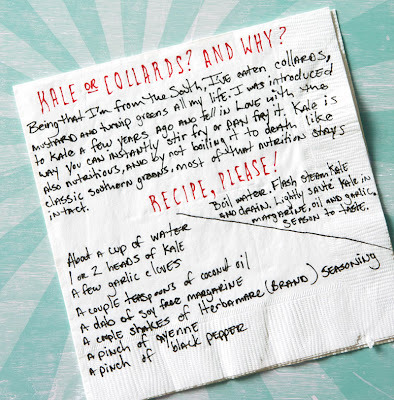 You can even make kale chips (oven baked).